The territorial changes of Hungary are the changes of the borders of Hungary throughout history. The greatest change happened in 1920, when Hungary lost over 70% of its territories by the Treaty of Trianon. 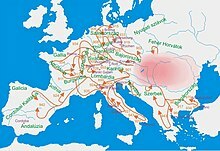 The Hungarian Principality, being a nomadic state, did not have strict borders, they wandered from place to place, and led campaigns to distant Western European areas. The Hungarian Principality (Hungarian: Magyar Fejedelemség) was formed around the 850s decade. Hungarians, a union of seven tribes, settled in the Carpatian Basin during the conquest of 895 (Hungarian: honfoglalás). In those times territory borders were not of key importance for their principality, but rather the people who belonged to it, consequently the principality did not have strict borders. The Kingdom of Hungary in their very first years (around 1000). In the year 1000, Stephen I was crowned King of Hungary, thus the Kingdom of Hungary had been founded. The administrative system underwent major reorganization during his reign. Croatia unified with Hungary around the turn of the 11th-12th centuries. The events surrounding the union of Croatia and Hungary are the source of a major historical controversy. According to the research of the Library of Congress a faction of Croatian nobles contesting the succession after the death of Zvonimir offered the Croatian throne to King Ladislaus I. In 1091 Ladislaus accepted, and in 1094 he founded the Zagreb bishopric. King Coloman of Hungary crushed opposition after the death of Ladislaus I and won the crown of Dalmatia and Croatia in 1102. The crowning of Coloman forged a link between the Croatian and Hungarian crowns that lasted until the end of World War I. Croats have maintained for centuries that Croatia remained a sovereign state despite the voluntary union of the two crowns, but Hungarians claim that Hungary annexed Croatia outright in 1102. In either case, Hungarian culture permeated Croatia, the Croatian-Hungarian border shifted often, and at times Hungary treated Croatia as a vassal state. Croatia, however, had its own local governor, or ban; a privileged landowning nobility; and an assembly of nobles, the Sabor. Other sources say King Coloman established the personal union of the Kingdom of Croatia and the Kingdom of Hungary by an alleged agreement called Pacta Conventa. Although, the precise time and terms of Pacta Conventa later became a matter of dispute; nonetheless there was at least a non-written agreement that regulated the relations between Hungary and Croatia in approximately the same way. Hungary in 1190, containing Bosnia and Dalmatia. Béla II reconquered Dalmatia in 1136 and conquered Bosnia in 1137. Hungary between 1370-1387, with the territories gained from Poland. During the reign of Louis the Great, Hungary and Poland were not only in personal union, but Hungary gained parts of Poland between 1370 and 1387. In March 1939, Hungary reconquested the whole Carpathian Ruthenia. In the Second Vienna Award of August 30, 1940, Hungary regained northern Partium and northern Transylvania. In April 1941, Hungary reoccupies Bácska, the Baranya triangle, and the Mura region. ^ a b c d e f g Curtis, Glenn E. (1992). "A Country Study: Yugoslavia (Former) - The Croats and Their Territories". Library of Congress. Retrieved 2009-03-16. This page was last edited on 31 August 2009, at 20:26 (UTC).